How to teach inference in the Classroom. An essential reading skill for teachers and students. Includes inference meaning, examples and teaching strategies. We've all been there at some point, a blank-faced student stares back at us in response to our question and states “I don’t know, teacher. 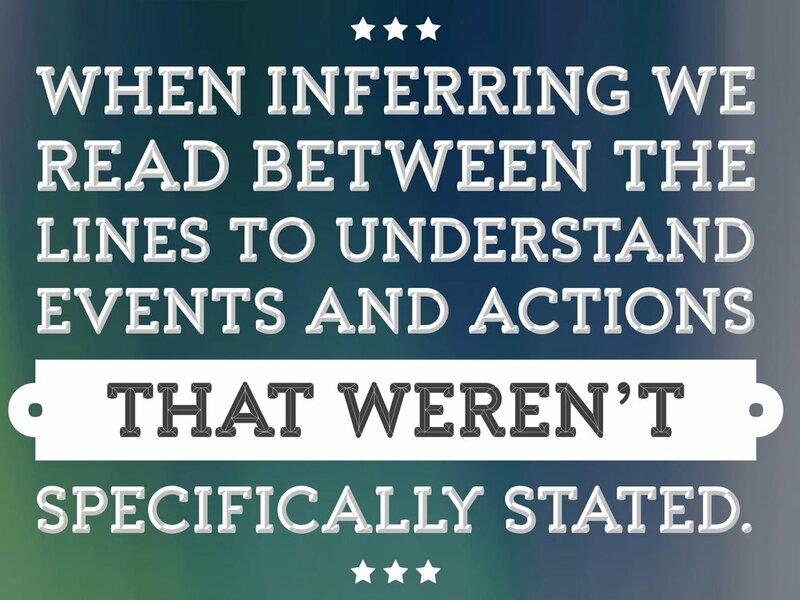 It doesn't tell us in the story.” Usually this response has been incited by an inferential question, but what exactly is inference? Inference can be defined as the process of drawing of a conclusion based on the available evidence plus previous knowledge and experience. In teacher-speak, inference questions are the types of questions that involve reading between the lines. Students are required to make an educated guess, as the answer will not be stated explicitly. Students must use clues from the text, coupled with their own experiences, to draw a logical conclusion. In this extract the writer does not explicitly state that the man in the story wants to get rid of the person he is addressing. He does, however, imply this is the case through the action the he describes. Reading this correctly is to infer. To imply is the throw, to infer is the catch. The teaching of inference skills is extremely important to our students. It is a higher order skill that is essential for students to develop to afford them access to the deepest levels of comprehension. Having a finely tuned ability to infer also has important applications in other subject areas too, particularly Math and Science. Given the centrality of pattern reading in these two subjects, it is no surprise that students will find these skills extremely useful when it comes to prediction and evaluation especially. Being able to infer from clues develops in our students an appreciation of the importance of basing our opinions on identifiable evidence. The usefulness of this skill transcends the walls of the classroom. In the world beyond the school gates, the ability to infer will serve students well in their interactions with others on personal, social, and business levels. ● More than one correct answer is possible. Higher level reading comprehension questions often ask students to draw on their powers of inference, especially in the why and how questions posed, or what questions that are concerned with the student’s own thoughts and opinion. Often students infer answers without being aware they are engaged in inference. For this reason, draw attention to how they arrived at their answers. Ask them how they ‘inferred’ their answer. This will mean they will have to explain how they arrived at their answer without reference to explicit information in the text. Ask them further questions to prompt how they arrived at their answer. Encourage them to point to the clues and implicit information in the text that led them to their conclusion. Here, we are working to uncover the mysterious process of inference by shining a light on it. PRediciting and Inferring... What's the difference? PREDICTING and INFERRING are often confused, but they are not interchangable concepts. Predicting is the process of asking what might happen next based on what we already know from inside and outside the text. Inferring is more a process of enquiring as to what the author meant? What does the cover artwork tell us about potential characters, setting, genre, audience? What leads us to these conclusions. Has the author gone for a whimsical fun title and font style or a bold, clear style? What might this have to do with the text? What clues does the text size and style tell us about the audience they are targeting? what hooks or strategies have been used in the blurb to give us some insight into the story. What obvious questions remain unanswered from the blurb? Why might have these decisions been made? If an act or event occurs within the test, note it down, or have a shared conversation if reading within a group to decipher your thinking and reaction. Whether you use post-it notes, pencil or otherwise books are meant to be dissected. Use it as a physical resource at times to identify points to question, challenge and infer over. Read a challenging paragraph, and discuss it as a literal text, and then re-read as a metaphorical piece. What is the differnce? If any, and why? Read a challenging paragraph, and discuss it as a literal text, and then re-read as a metaphorical piece. What is the difference? If any, and why? Were your expectations met from the the pre-reading inference? Do you think this was intended by the author? What imapct did this have? Setting riddles to solve is an excellent way for students to gain the necessary practice to hone their skills of inference. The stronger the students are, the more complex the riddle set can be - this makes for easy differentiation for various abilities. Developing this ability to solve riddles requires students to grow in confidence in reading for inference. Riddle-solving can be a great introductory activity on the subject of inference and can demonstrate to students lacking in confidence that they already have some understanding of how the concept works. We often urge our students to “Show, Don’t Tell!” in their writing. As their writing skills improve we want them to move away from describing the characters in their stories with long lists of adjectives, in favor of revealing their characters through the things they do and say. To help students develop their ability to read inference, set them the task of identifying a character’s traits in a story exclusively through the things they do and say. This a great reading extension activity that can be easily used as a homework too. Students can work through a story, recording the information in three columns entitled: Character, Trait, Evidence. Remind students they are looking for implicit evidence, not things the writer has stated explicitly in the narration. You can also bridge this reading activity into writing. Have students write short paragraphs about a personal experience. Tell them not to state any of the emotions they experienced explicitly. Instead, have them write details that help the reader understand how they felt. Have student volunteers share their writing and briefly discuss each piece. What details helped the reader to understand what the writer was going through? What other details could be added to the writing to enhance this? This activity works well as an extension of the previous exercise and is basically an inversion of Show, Don’t Tell! In this exercise students must take a few sentences of inference and translate them into explicit statements. The examples of inference identified in the previous activity will serve well as the material here. This type of exercise helps students to recognize exactly what is being implied in this often very subtle means of communication. For this activity, pop into the kindergarten library and grab yourself some picture books. Ignore the inevitable eye-rolls and moans of derision of the students in front of you and explain to them that you're going to give each of them a book and they are going to ‘read’ the books to each other. Children's book illustrators are masters of inference. They tell stories through the skillful use of visual clues. Students must become a translator of these visual clues into words. Encourage stronger students to also translate the inference in the picture into their narration by avoiding explicitly stating things. You can also do a variation of this task by providing students with captionless photographs or pictures and asking them to tell the story of the picture. Students can compare and contrast their inferences for each picture. Authors have the luxury of writing endless chapters to paint pictures in our mind and tell a narrative. Film makers do not have this luxury and are both bound my more restraints but given a deeper toolbox to tell a story. If you have ever listened to a directors commentary whilst watching a film you will really appreciate the effort a film maker goes to use inference in their craft. Everything included in a film is there for a purpose, the setting, background props, dialogue, music are all calculated decisions used to build emotion and story. Sometimes what is left unsaid or unshown can also tell us more than what is actually in the film. Inference and film are a match made in heaven in the classroom and will provide your students with the analytical skills to watch films at a much deeper level. Take a look at this clip below to get an understanding of the level of inference uncovered from a 6 minute Pixar animation. ● Encourage students to activate prior knowledge through timely discussions. 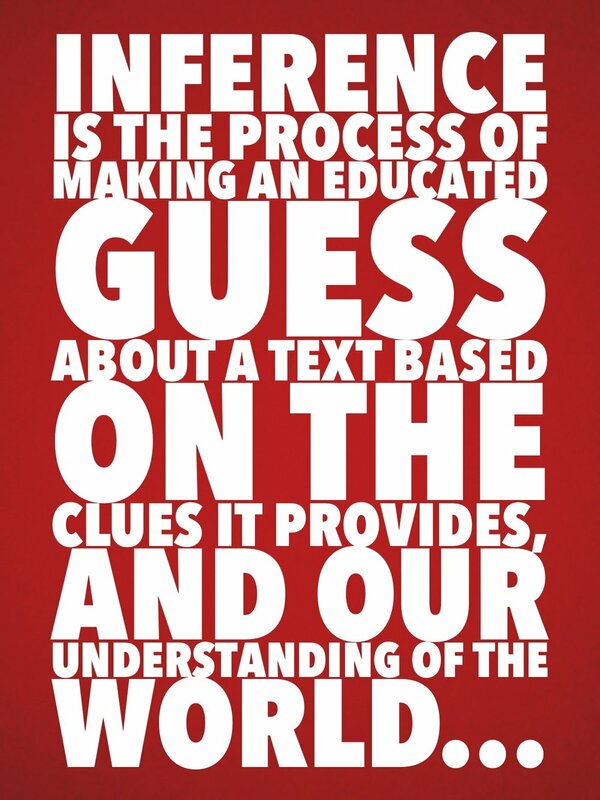 Be sure to offer opportunities for reading inference across a range of genres. While fictional stories offer the greatest number of opportunities to read for inference, other genres do offer opportunities too. Expository texts, for example, promote opportunities for more conscious inference making. You can help students greatly by modelling answers yourself and by ‘thinking aloud’ to show your students how you arrived at your conclusions. When students are engaged in making their own inferences, encourage them by asking inference-generating questions that will propel them along the path. The art of inference is a skill, like most skills, that improves with practice. There will be ample opportunity to reinforce the skills of inference through the course of the average English lesson, as students engage in discussion, complete comprehension exercises, study poetry etc. Even though the skills of inference will be called upon regularly in lessons that are not primarily focused on developing this skill, it is still important that some discrete lessons are delivered that do focused primarily on inference. Inference is often difficult for students to understand initially, especially for younger students. It can often slip just beyond their grasp due to its subtle nature. Begin with baby steps. Try to climb down the ladder of abstraction and peel back the layers to make the implicit explicit. With practice, students will soon be able to move beyond recognizing and reading inference in the works of others to incorporate it into their own work.